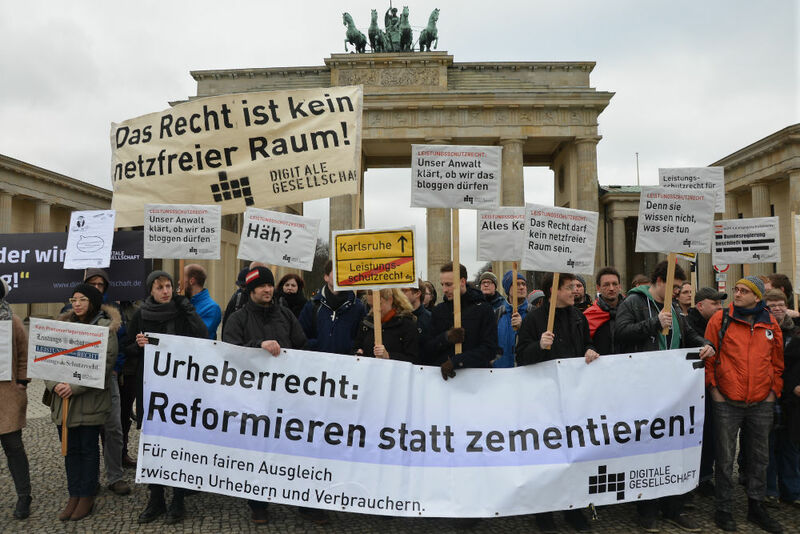 One of the Alpha-Bloggers in Germany, Johnny Haeusler from Spreeblick, wrote the other day about the mounting legal costs of operating a blog that reports on and comments the news (Geld ausgeben mit Blogs). He's apparently already spent 10,000 € on legal fees fighting take-down notices from lawyers, although at least he runs ads and has income. People and companies don't like it when you say anything negative about them. They try and root out all of the reports about problems with their products or the deeds that they did and try to silence people. I am quite allergic to people who give themselves out to be scientists (for example because they wrote a doctorate or publish scientific papers that turn out to be plagiarisms or to have cooked their data or some such) and who react to criticism or statement of fact by sending out the lawyers. I much prefer to see arguments. Don't threaten me, convince me! I myself just had a tussle about an article that I wrote on this blog in October 2011 about a conference on good scientific practice in medicine at the Charité. I noted that the journalist Hubert Rehm had spoken about a few cases, amongst them B.S. (for more information, see Laborjournal (link removed), they have reported in depth on the case). A few weeks ago I received a letter from a Swiss law firm with so many names on the masthead, it took almost half of the first page. Take down the reference to B.S. immediately or else. I consulted a lawyer, who noted that I am in a very special circumstance: I do research on good scientific practice, and in Germany a researcher is permitted to publish as they please, as long as it's not illegal. And it is never illegal to state the truth. All the same, the lawyer suggested that I tone down my sentence. So I did, and had the lawyers write an (expensive) letter to that effect. What I don't understand is what these lawyers and their customers think that they are going to achieve by trying to silence everyone. Have they not heard of Barbara Streisand? Update: On 2013-04-18 I removed the link to the Laborjournal article. The lawyers insist that even linking to the publication that they consider to be illegal is not okay. By linking I am not assuming the position of the items I link to - I am reporting on what what was said and giving my readers the opportunity to decide for themselves. This is covered by the laws governing freedom of speech and the freedom of the press. I am not removing information because I made an error - I am making the changes clear while removing the identifying information because I do not wish to fight a legal battle on this particular issue. Time and again I get exasperated with journalists who are only out for a quick sensation instead of actually researching a question. Last Friday a journalist wrote me an email at 3 in the morning asking me to help him answer a question from a student. They are starting a new "service", answering real questions. The question was: How can I find out if I have plagiarized in my term paper? He wanted a very short answer, 4-5 lines, and it could be as "perky" (flott) as possible. I was traveling, giving a workshop on plagiarism detection for professors and leaving for a week of vacation in the morning. Since this is not a question that can be answered in 4-5 lines, I just didn't reply. So what was the result? I was contacted today by a friend with a question about a software system that I had "recommended" in some article. Checking my alert service I found the article and was aghast -- the software in question was one that came in last in my 2010 test of so-called plagiarism detection software. The entire article turns the results of my tests upside down. Our recommendation: Only use these systems when suspicions of plagiarism arise that cannot be found with 3-5 words in a search machine. The focus should be on teaching students about plagiarism and how to avoid it instead of investing time in using software. Most of the work involved later is in preparing a plagiarism case and dealing with the plagiator, and for this good documentation is needed. Very few systems provide good documentation. (1) Die Berliner Medieninformatikerin Debora Weber-Wulff hat vor Kurzem verschiedene Softwares getestet. Sieger war das kostenpflichtige Programm turnitin, das mittlerweile an über 80 deutschen Universitäten und Forschungseinrichtungen genutzt wird. Sie können es möglicherweise über Ihre Hochschule kostenlos nutzen. (2) Eine brauchbare kostenfreie Alternative ist Viper. (3) Kurze Texte können Sie außerdem gratis bei PlagAware kontrollieren lassen, das in Weber-Wulffs Analyse ebenfalls solide abgeschnitten hat. ad (1): "vor Kurzem" means recently. Um, my last test was 2010, published in 2011. We are currently retesting the software, hoping to publish the results in September. These tests take a lot of time to conduct. "Sieger" means the winner. There were no winners. There were 5 systems that were given the grade of C-, as they did not even manage to reach 70 % of the points in the test. None of these can be considered winners, but they can be used as tools if one has a suspicion of plagiarism. They have far too many false negatives and false positives for general use, and all five are on about the same level. And the idea of letting students use them (for free even!) to run their papers through until they come out clean gives me shudders down the spine. The students will resort to swapping word orders and using unfitting synonyms until the numbers (which will differ for the same text from system to system and even in some cases from test to test) reach an acceptable level. There must be someone with experience in reading and interpreting the reports to go over this together with the students if it is to be a meaningful learning experience. ad (2): Oh dear. I suppose the journalist was looking for a free system, as opposed to the expensive ones. I have no idea what terms he googled to find this system, but he didn't read this on my results page. Technically, he doesn't say that I find the system useful ("brauchbar"), this is his own judgement. But sandwiched in between two references to my work, people misread it as me recommending it. Nothing could be further from the truth. The street address is the same for the company offering the plagiarism detection service and for a paper mill / essay writing service. Their respective telephone numbers differ only in the last digit. And actually reading the "Terms and conditions" should scare the daylights out of anyone: If you submit a paper to Viper, you give the company "All Answers Limited" the irrevocable right to keep a copy of the paper forever and to use it for marketing purposes, either for Viper or any "associated website". The email account I used for the test (we use a different email address for every test to see what kind of spam shows up later) now gets fun letters with subject lines such as "Enjoy the sun and get your dissertation done on time". Oh, and Viper has the distinction of being the worst system for detecting plagiarism in the test, coming in last with just 24% of the effectiveness points on all of our test cases in 2010.
ad (3): Another system is mentioned as being "solide", respectable, in my analysis. Again, "partially useful" is not even close to respectable. I wonder why the journalist is in effect advertising the services of three companies, one of which is extremely questionable, instead of really trying to answer the question. At least the comments are good: Most of the comments note that one does not actually plagiarize by mistake. If you are taking careful notes and making the difference clear between what is your own words and ideas and what is from someone else, you are fine. Now, how do I get journalists who just breeze through writing something like this without actually reading and understanding what hat been written on the topic to start doing real research themselves instead of just blowing off an email to me? I suppose I need to answer all journalists, as soon as possible, with short and snappy sayings. I do wish, however, that they would read at least the summaries before they ask. I didn't like the intentionality that he had in his definition, but it was good that he included the arts here, and I really liked the phrase "Anschein eigenen Schaffens" (the appearance of own work). As it turns out, Paul English was himself accused of plagiarism. In 1908 a Viennese author, Dr. Stern-Szana, prepared a handwritten manuscript for a book. It was purchased in 1920 by a publisher in Berlin, Socher. In 1922 Socher gave the manuscript to a typist to have it prepared for publication. The typist was Paul English. The book, however, was never published by Socher. But in 1928 Paul English published a book with the exact same title and extremely similar structure, as well as occasional word-for-word copies. Socher took English to court in 1929 and there is a wonderful book (that has now been digitized) that Socher put together for the court case, a side-by-side of English and Stern-Szana's manuscript. English republished his book with a new title, the contents unchanged. The court case seems to have gone on to a higher court in 1932, the trail is lost there. I will be researching this during my sabbatical in the hopes that the result of the case has not been lost in the destruction wreaked by the Second World War in Germany. If anyone happens on a clue, please contact me. A booklet with the definition by English was first published as "Plagiat!! Plagiat!!" 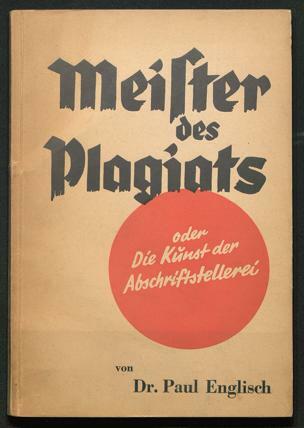 in 1930, and then in an extended version as "Meister des Plagiats - oder die Kunst der Abschriftstellerei" in 1933. With the knowledge of the history of English and the context from page 81 of the latter publication, I now read his "definition" as an attempt to wash his hands of the taint of plagiarism. I have now removed the definition from my plagiarism portal and from my slides. I now use Teddi Fishman's definition. I apologize for any inconvenience.